With plenty of moving services, Meathead Movers is fully prepared to make Santa Cruz your new home. Our clean-cut student athlete movers are dedicated to fulfilling all your moving needs efficiently. Santa Cruz is renowned for its temperate climate and outdoor activities. No matter what reason you’re moving to Santa Cruz for, you should be sure to check out the moving services that Meathead Movers has to offer. No other California moving company can offer the same level of customer service and quality that we can. With both the beautiful coastline and dense redwood forests, Santa Cruz is a great place for people who are looking to live an active lifestyle. The Santa Cruz Boardwalk is a great place for residents to go for some family-fun and relaxation, and the University of California Santa Cruz allows residents to further their education and creates a vibrant, college-town atmosphere. Meathead Movers can take care of your upcoming commercial move, local move or long-distance move. We offer support and assistance during every step of your move, seven days a week with our signature moving concierge service. We also offer fixed pricing plans for long-distance moves and a 100% satisfaction guarantee. If you are worried about who will be handling your hard-earned items, don’t be. All our movers are student-athletes who are put through a rigorous screening and training process before we let them on our trucks. Our movers are clean-cut, drug-free, non-smoking, polite All-American student-athletes who will jog whenever they’re not carrying your items. For long-distance moves, we make sure that the same moving crew who loads and unloads your truck, to ensure accountability and reduce confusion. We also offer short and long-term storage options, and a packing service through our sister company, Princess Packers. 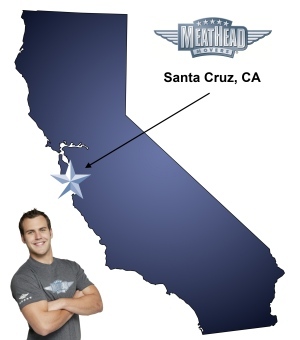 Don’t start moving to Santa Cruz without giving Meathead Movers a call first. Not only will our staff provide you with more information about our services and what makes us special, but we’ll also provide you with a free no-obligation moving estimate. We won’t pressure you to use our services because we feel that other movers just can’t compare to us. Moving to Santa Cruz? Here are some helpful resources. View more Santa Cruz resources. All went well. Expensive, but well done. The guys went above and beyond. Best move experience ever! The guys were professional and experienced! From the first phone call, I was So impressed with the responsiveness, friendliness and professionalism of every single person I had contact with (and I'm not easily impressed). From Greg, my contact through most of the move, to RJ & Jimmy who packed and moved us, every single step of the way was flawless and made as easy and painless as moving can be. Highly recommend Meathead Movers!! Friendly and competent; ready to do a little extra; reliable. The movers were so professional and easy going. They were efficient, but made sure to be careful with our things and make sure we had everything where we needed it. They were really great and made the move very easy and stress free.